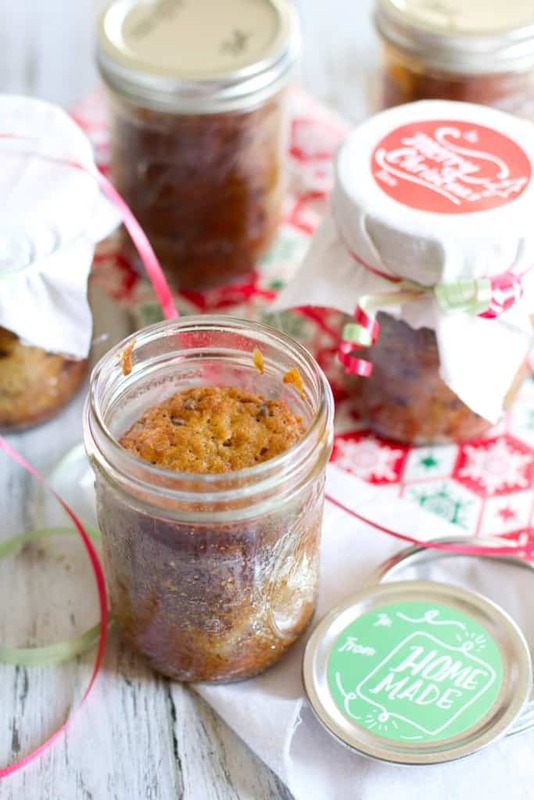 We can hopefully all agree that homemade gifts are some of the best. When you are good in the kitchen, nothing feels better than spreading the love and giving something delicious that you made- am I right? I’m giving people baked goods all year round, but this recipe is extra special. It is so compact, so perfectly portioned and packaged that handing them out made me giddy. Why have I never thought to bake something in a jar before?? It works so well and is just so darn cute. Baking right inside the jar was more simple than I’d imagined. First you of course have to grease the inside of the jars, and then your batter goes in- about 2/3 full seemed to work well. Don’t make the mistake of trying to bake these on a cookie sheet though- they only bake evenly when placed directly on the oven rack. (Which seemed tricky but isn’t so bad.) They bake up perfectly even and the lids actually self-seal keeping the bread airtight and lasting up to a week. Some pretty ribbon, a label, and a fabric square and you have one adorable homemade gift! If you want to make this recipe in a loaf pan- the regular recipe for my Best Banana Bread (Ever,) is the place! Preheat oven to 325F. Grease or spray 8 wide-mouth pint jars, set aside. In a large bowl whisk together the melted butter, and sugars. Add the eggs one and a time and vanilla and whisk until smooth. Sprinkle the flour, baking soda and salt over the butter mixture and stir to mix until just combined. Fold in the bananas and sour cream/yogurt/buttermilk. Gently fold in the chocolate chips. Carefully spoon batter into jars, filling about ⅔ of the way. Wipe the rim of the jar down in case any batter spilled/splashed. Place the jars directly into the oven, carefully arranging them on a middle rack. Meanwhile sterilize the lids of the jars in boiling water and set aside. Bake for about 45 minutes, or until loaves are golden brown and a toothpick inserted comes out clean. Place the lids onto the jars right out of the oven- in about 10 minutes you should hear a "pop" and they are sealed. Bread will last in the jar up to a week. As you can imagine. Sealing warm banana bread traps the moisture and makes it very very moist but the time you actually eat it. This is not a bad thing, but depending on how you like the texture you may choose to let them cool a bit before sealing. The lids won't "pop" to create the seal unless they go on hot, but I think the breads would still last a few days since it would be airtight. This is a great gift idea! And I just love how little they end up being. This is the cutest idea! Thanks for sharing, I’m definitely trying this :) Do you think this would this work with a bigger jar as well? This is seriously one of the most brilliant ideas ever! Can’t wait to make some to give to family and friends, I’m sure they’ll be amazed as much as I am! Thank you, I’ve just found my gift for my volunteers at the Outreach Office! Do you refridgerate these if keeping for 3 days? I am worried about molding because of moisture in the jar. Ours didn’t mold at all after 3 days but you could store in the fridge if you were worried about it. Thank-you for your reply. I am anxious to try this. Hi. You choose one, correct? sour cream, greek yogurt or buttermilk. What’s the taste difference? I have used them all but this batch was made with buttermilk! Hi. I tried this today with buttermilk. Taste is great. Only issue is seemed a little “wet” on the outside, mildly on the inside. Any suggestions? Could you freeze these after making ? SO cute! I love this idea. I might just make a batch for myself. To eat, not gift. I’m on a budget for Christmas so this seems like a really cute gift idea. How long does it last being sealed in the jar? I would say about a week! I love this idea! 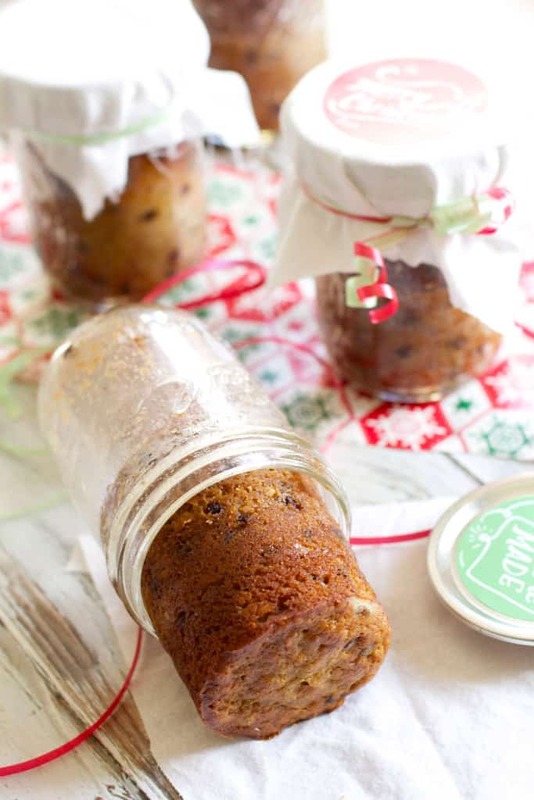 Have you ever tried any cake recipe in a jar? Any suggestions? I never have tried but I’d like to! The bread IS extremely moist due to the steam when you put the lid on the jar…if it’s too much so maybe they needed to bake a bit longer? Our family lives this recipe! Thanks for sharing!!! Hello all u cooks out there in banana bread land ! Narrower before the lids go on………but………..
Full…….bake at prescribed temp in the recipe ……. Have been using tin cans for 100 yrs. No kidding ! 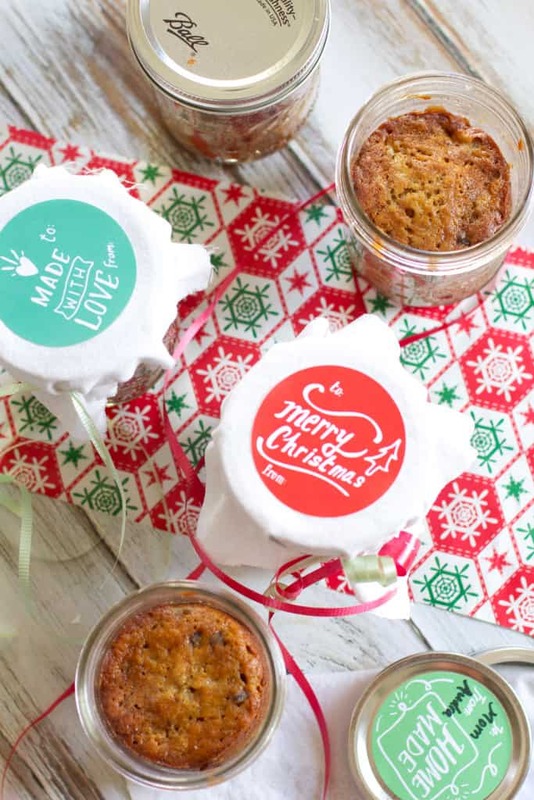 Nicely coat the tin can without leaving an abundance of flour inside . Rack INSIDE your oven ON TOP OF the oven rack ! Your jars will balance nicely !